This really isn’t tied down to one particular function. Once you have access to the bus for a microcontroller you’ll only be limited by your firmware writing skills. [Peter] has posted an archive with all of the open source files, as well as an illustrated step-by-step board assembly. We’ve embedded the schematic from that archive after the break. This is EXACTLY what I wanted to use my Prius steering wheel controls to control my mp3 carputer. Would love to see this project in kit form! Perhaps on sparkfun? is there a way to then prevent the other car electronics (the stereo at least) to interpret these button presses? I’ve been going through the archives — so this might not get to you. But! I imagine that the car radio watches the buttons in the same way, after all, you should be able to switch radios out if you buy a new one. You might have to pry it out and unplug the connector. 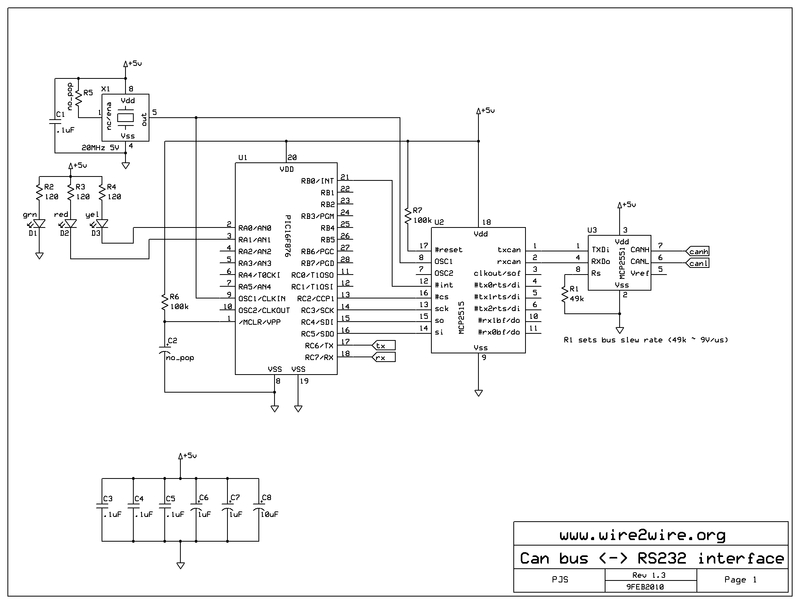 AFAIK a CAN bus is not something universal to every car, the way OBDII is right? Where is the connector located inside the car? There are ready to go solutions for that purpuse available: for instance an Atmel STK600 has a CAN-transceiver on-board (no need to use those lame Microcheap products). Or just buy one of the OTS interface boxes for the stock steering control buttons. Those have been available for a decade now. Also you scardey cat whimps thinking you will disable brakes or deploy air bags dont know anything at all about canbus and automotive electronics. I suggest you LEARN ABOUT IT before being scared little girls. There is this secret thing called the internet that has all that info out there. you have to use the secret Google to search it. h3po: yes…. remove the stock stereo and it will not interpet the keypresses. @dcroy – show me one PIC with a built in CAN transceiver. There are plenty of PICs with built in CAN controllers. But built in transceiver? I have never seen such a beast. Heck – I’ve never seen an MCU with a built in CAN transceiver. I truly wish they existed. I have a separate button that controls the on/off for my cruise control. I wonder if I could use my cruise control lever with this thing while the main switch is “off”… Any thoughts? Will this pick up on all sorts of button presses in the car? the ELM 327 (and i think their entire line) chips are based off of PIC’s … 40f family or something along those lines? sorry, not terribly familiar with the pics but i do know its a pic! now this is actually a useful device! The CAN bus that connects to the steering wheel is not the same bus that is available via the OBD connector, there is a CAN gateway in between. OBDII uses CAN to talk. So if you sniff a packet of data, say when you press the door lock button, are you able to transmit that same packet back in from the uC used? Or is the OBDII port read only? yeah, your STK6000 is a 200$ dev board to program Atmel chip. Also, you can not control the primary function of your car by sniffing CAN packets! There is two separate CAN networks, they are separate by a electric firewall. Not all manufacturers use CAN to control button presses on the steering wheel controls of late model vehicles. The ones I know that do use CAN extensively are most German makes VW/Audi/Porsche/Mercedes and Dodge/Chrysler (which still raids the Mercedes electronics bins for their new vehicles). Later model GMs don’t exactly use a CAN network. Theirs is either an 11 bit or 29 bit system which they started using around 2000 or so. Japanese and Korean makes simply use differing resistance values or voltage values to distinguish button functions to the factory radio. How do I know this? 13 years doing car audio and security and being that guy that “figures sh#t out” armed only with bosch relays, 1 amp diodes, and a multi-meter. Also using some good deductive reasoning with SW control information from pac-audio.com. I’ll still see about putting this CAN sniffer together since I know where I can tag the can signals in most car and it would be great just to see what I can do with that info. Messing with the CAN bus can be fatal, every commercial product for CAN intercept and decoding sourcing will warn you not to use in a moving vehicle. Make sure you have defined the CAN based protocols for your application. J1939 is common but allows for proprietary code. The entire bus can be used for every thing from RPM’s to throttle position. As a hardware developer for the auto industry, I have a plethora of stories about development vehicles gone haywire. So proceed with caution. @flapjack: Fatal schmatal, caution to the wind, devil-may-care research. Ain’t nobody’s business if you do. I tried to get Hackaday to post this, but they aren’t interested. If you want some hints on decoding the data stream you get from your sniffer, I wrote a piece for our software study group about sniffing and decoding the CAN protocol from my 2002 MINI cooper. @AlanKilian we’re very interested in what you’ve done, would you get in touch with us please? i am doing the same project..just clear me one thing how i compose message in standard data frame..i am very much confuse in it..
hi~do you have another ways to control other parts of the vehicle?how do you do that? Hi. Where is the open-source archive mentioned in the article?